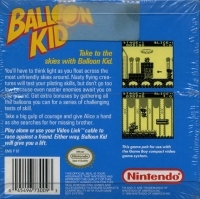 Box Text: Take to the skies with Balloon Kid. You'll have to think light as you float across the most unfriendly skies around. Nasty flying creatures will test your piloting skills, but don't go too low because even nastier enemies await you on the ground. Get extra bonuses by gathering all the balloons you can for a series of challenging tests of skill. Take a big gulp of courage and give Alice a hand as she searches for her missing brother. Play alone or use your Video Link cable to race against a friend. Either way, Balloon Kid will give you a lift. 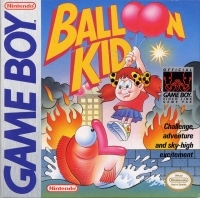 This is a list of VGCollect users who have Balloon Kid in their Collection. 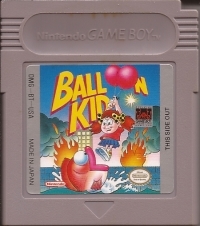 This is a list of VGCollect users who have Balloon Kid in their Sell List. This is a list of VGCollect users who have Balloon Kid in their Wish List.